route at right. Map by Andrew J. Hatch. 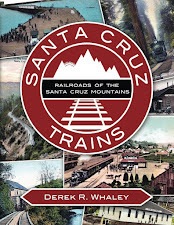 Although the Lompico subdivision was never directly serviced by the Southern Pacific Railroad, the Union Mill & Lumber Company operated within the Lompico Creek valley from 1881, when the narrow-gauge South Pacific Coast Railroad was still independent. The company was founded on July 15, 1881, by T.B. Hubbard, D.L. and I.B. Kent, William Armstrong, and N.B. Bowes, and the partners began erecting their mill at the confluence of Zayante and Lompico Creeks within days of incorporation. The mill officially opened on the week of September 3 of that year. At this time, Eccles and Union Mill stations became indistinguishable, but in 1891 they officially became separate stops, with the Union Mill Spur 0.3 miles to the south, although that distance is in reality an administrative overstatement since the Union Mill's switch was less than 0.2 miles from the Eccles station platform and the two stops shared a long siding that paralleled the mainline on the east. The precise location of the mill is uncertain, but a large clearing on the west bank of Lompico Creek just after its confluence with Zayante Creek is a good candidate. This clearing, undeveloped today, is well-situated at the mouth of the Lompico Creek valley and is almost perfectly the correct distance from the railroad right-of-way. At its height in the late 1880s and early 1890s, the mill was capable of producing 50,000 board feet of lumber per day and the mill was run by a 100-horsepower steam engine. Most of the lower Lompico Creek valley was flooded to create a large mill pond that fed directly into the mill, and steep skid roads high up in the hills brought the felled trees to the pond. When precisely Union Mill shut down is unknown, but it remained on company records until 1910. This timing suggests that the spur was not upgraded to standard-guage in 1908-9 when the rest of the line was upgraded. As such, it could no longer operate and the stop was abandoned. Very little is known about the history and operations of the Union Mill, unfortunately, and no confirmable photographs appear to have survived. In the 1920s, the lumber tracts of the Union Mill & Lumber Company were purchased and converted into the Lompico residential subdivision. The mill property itself may have become Camp Wastashi (later Camp MayMac). 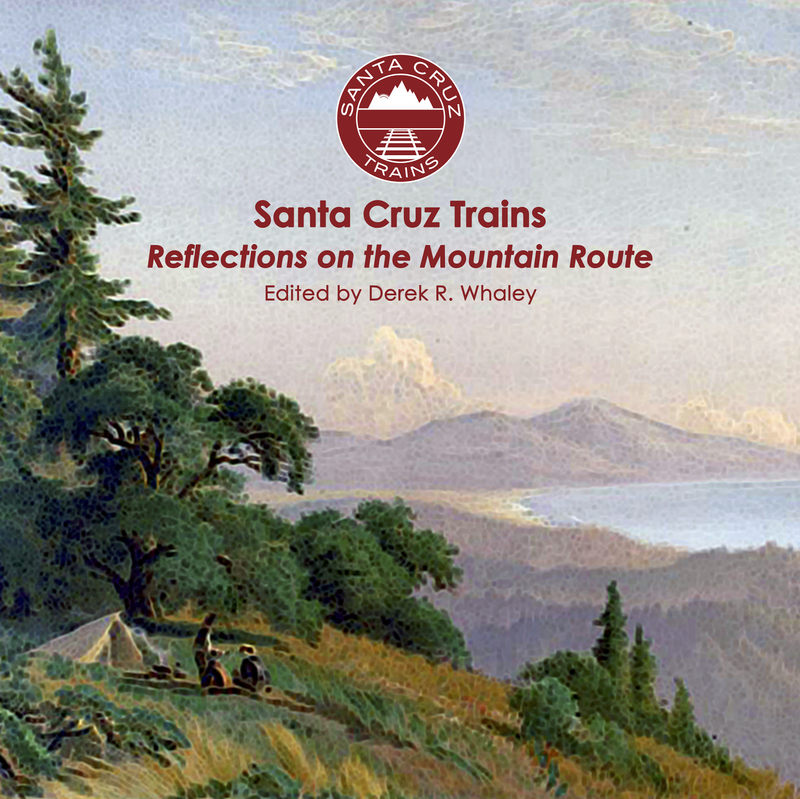 The site of Union Mill Spur's switch begins at the northernmost edge of Roaring Camp Railroads' property, just south of the southern branch of Zayante School Road. The right-of-way for the spur then passes down Zayante School Road to East Zayante Road, briefly paralleling East Zayante Road on the east bank before crossing it near the junction of East Zayante with Lompico Road. 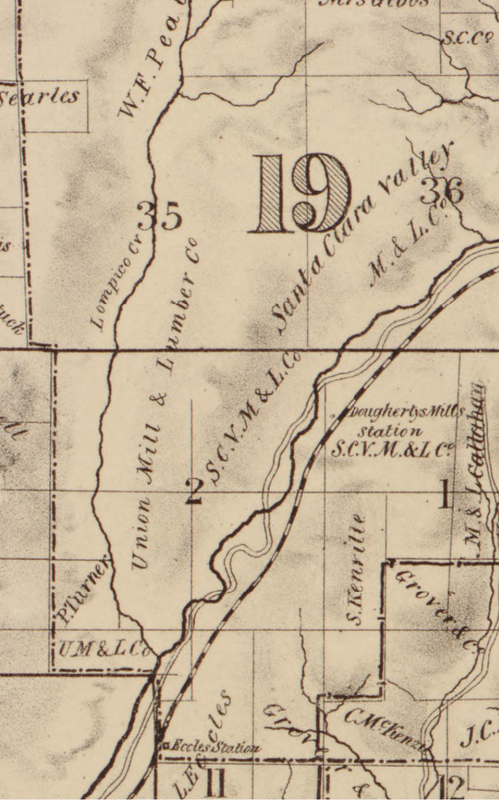 The precise location of the Union Mill is unknown but was probably just north of this intersection on the west bank of Lompico Creek. I've been wondering about Union Mill ever since I got Hammon's book and looked at his maps. 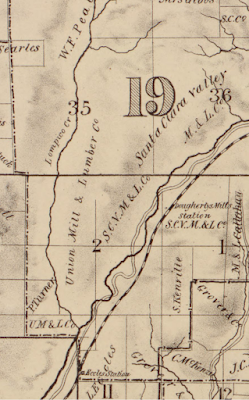 There's a great parcel map from the 1890s that shows the Union Mill parcel as located on the west side of the ridge that divides Lompico and Zayante creeks (http://www.historicmapworks.com/Map/US/1597521/Santa+Cruz+County+1889+Wall+Map/Santa+Cruz+County+1889+Wall+Map/California/). It is a strange place to situate a mill however because that hillside is quite steep. I had assumed the mill was located on the flats to the west of Lompico creek, but instead, the parcel runs up the ridge with Lompico creek as its western boundary. Considering the geography of the area, the most level place to run a spur line would be to follow Zayante School Rd down to the creek and then it probably ran along E. Zayante Rd to the mill. I can't imagine them building trestles or digging cuts for such a minor spur line. Based on Hammon's book, it looks like it was a narrow gauge spur, right? Thanks for the link, Lawrence. I have taken a screen capture of the section and placed it above. I think you missed the small segment of U.M. & L.C. land located on the west bank of Lompico Creek, however. Still, very helpful in identifying the locations of things. I'm still not entirely sure where the actual spur was located, but Hamman suggests it crossed the creek, probably just south of the confluence of the creeks which is perhaps why the Union Mill owns land south of it. It was definitely narrow gauge, and I don't think it supported actual engines, only horse-drawn flatcars like the Powder Mill spur.